You were born to be healthy! Your body’s ability to heal is much greater than you have been led to believe. Chiropractic is quite simply the science and art of unleashing the body’s potential. Our life is complex and we have many physical, chemical, and emotional stressors in our daily life. This causes what we call subluxations, which are joints that are not moving properly, which create a pattern of negative impact on the nervous system. Your nervous system is the key to the function of your whole body, including your health. Your nerves connect and communicate between your brain and your body. A subluxation causes interference in that communication. There are many signals that indicate a subluxation is present. Pain is the last sign of a problem, not the first! Too often though, its the first reason people take action. Subluxations can be silent, in that they have not yet created a symptom, or they can be subtle body signals that we consider “normal”, such as heartburn, fatigue, menstrual cramps, poor digestion, poor immunity, inability to handle stress… and many others. When you consider the amount of stress in our lives, it’s no wonder many people suffer. Chiropractic can help your body heal naturally! My goal is to help people and their animals healthy, stay healthy, and have the best life possible with chiropractic. I correct subluxations in the body and help show you ways not to re-create them in the future with healthy lifestyle suggestions for both animals and humans! WHAT IS CHIROPRACTIC? 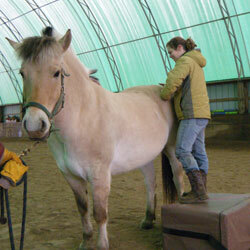 | HOW DID I GET INTO ANIMAL CHIROPRACTIC? | HOW DID I BECOME A CHIROPRACTOR AND DO I STILL SEE HUMANS?